ecoIron - All these whirring boxes. : What's He Smiling About? 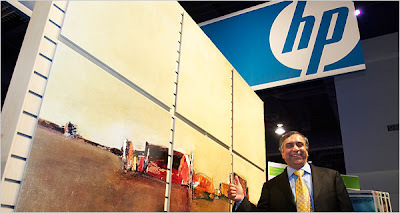 That's Vyomesh I. Joshi, the senior vice president in charge of Hewlett-Packard's printing division and he's happy because revenues, profit, and margins are all up at HP. Because, you see, people are printing out things like crazy. Not just anything mind you; according to the article, about half of what is being printed out is the Internet, turning bits and bytes in oil (ink) on vegetable (paper). And just when you thought that dog had stopped hunting; is this phase two of the redesigning the bags that that ink comes in? Guys, you're leaving me breathless - I liked the energy reduction thing better.